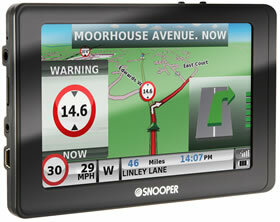 Snooper SC5800 Ventura satnav is a satnav and dash cam built in to one device. Plus you can subscribe to Snooper's speed camera database of fixed and mobile speed camera locations. 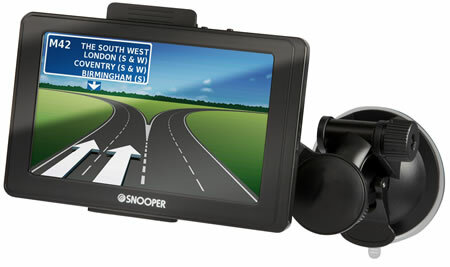 Featuring a 5-inch touchscreen the Snooper SC5800 is available with European mapping. The maps are free to update for the lifetime of the product. Multi-route technology also enables you to navigate to 16 different destinations. The dash cam will record in continuous mode so you never miss a moment whilst driving on the road. The SC5800 is also bluetooth enabled so you can make and receive hands-free calls with a compatible smart phone. Snooper SC5800 DVR Ventura has been discontinued. The Snooper SC5800 DVR Ventura has been replaced by the Snooper S5900 DVR Ventura (released in May 2018). Accessories and spares for the Snooper SC5800 DVR Ventura can be purchased here. 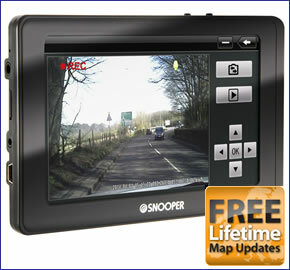 Snooper Pro SC5800 DVR Ventura is a GPS satnav and a dashboard camera all built into the one device. The screen is a 5-inch widescreen LCD full colour display. The mapping preloaded with the Snooper satnav is a choice of either UK and Ireland or Full Europe. You will also get access to Snooper's AURA speed camera database to warn you to all fixed and mobile speed cameras across the UK and Europe. In addition there is also a My Speed XL feature that display in large format your vehicles speed and the road speed limit. Free lifetime map updates are included with the Snooper SC5800 Ventura so you will always have the latest mapping. The Snooper SC5800 will route you along the best, quickest, shortest route available. You can also include roads you prefer to drive along during your journey using the "your route" feature. The feature Junction View provides a full screen image of main motorway junctions giving you advanced guidance as to the road layout ahead. Lane Guidance will also tell you which lane to be in for all road junctions. You can also use Junction numbers to navigate. The Snooper SC5800 Ventura DVR features a database of 20,000 campsites throughout 31 countries. These campsites are provided by The Caravan Club, The Camping and Caravanning Club, ACSI, BordAtlas and Facile En Route. This database is searchable by facilities such as whether there is a swimming pool, watersports, by the coast or a river, nearby shops and restaurants, etc. Some of the campsites also show a photo on the units screen before you set off. Free lifetime traffic information will provide warning to traffic jams in the road ahead and it will also provide re-routing around traffic congestion. Plus, if you take a wrong turn then the Snooper satnav will re-route you to get you back on your journey. 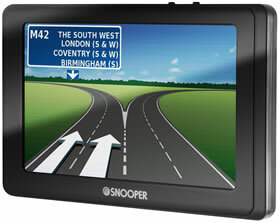 Snooper Ventura SC5800 DVR car sat nav calculates your route for your caravan or motorhome based upon the dimensions of your vehicle (height, width, length and weight). Simply enter your vehicles dimensions and it will provide turn-by-turn navigation to your destination avoiding height and width restrictions, e.g. low tunnels and narrow roads, etc. There is also a car mode for use when driving in a car without towing a caravan. The dashboard camera included with the SC5800 DVR Ventura will capture events in the road ahead. The recorded video will provide evidence as to what happened in the event of an incident or accident which you can also view instantly onscreen on the roadside. The dash cam will record in continuous recording mode so you will never miss a moment. You can also use recorded evidence to help prove who was at fault in a incident to an insurance company. There is also a built-in microphone for recording sound. The dash cam will also record the GPS location of incidents, time, date and vehicle speed. Multi-route technology also features on the Snooper SC5800 DVR Ventura. Simply enter up to 16 different destinations (post codes) and the Snooper SC5800 will route you along the shortest route to visit each of the locations. Points of Interest (POI's) preloaded to the Snooper Pro SC5800 DVR include hotels, petrol stations, train stations and more. You can also select to use the POI corridor search which suggests POI's along your pre-programmed route. Bluetooth technology is also built-in to the Snooper SC5800 so you can make and receive calls with a compatible smartphone. This will enable you to communicate over the phone whilst driving with both hands on the wheel. The Snooper SC5800 DVR is also compatible with Tyre Pilot which will display tyre pressure and temperature and it will also provide audible alerts for pressure drops and abnormal temperatures. This feature makes your journey safer when driving in many ways. You will extend the life of your vehicles tyres and also your vehicle will become more fuel efficient. There is also a Home and Office mode so that at the touch of a button you can be navigated to your home or office address instantly. Snooper Player enables you to playback video recorded on the dashboard camera on your PC computer. The Ventura SC5800 will also alert you if you exceed the speed limit protecting your driving licence. There is also an optional AURA speed camera database. The database provides advanced warnings to both fixed and mobile speed camera locations across the UK, Europe. Click here to read more about the AURA speed trap database. Do you have a question about the Snooper SC5800 Ventura that's not been answered on this webpage? Please see our car sat nav FAQs for questions from other customers and visitors. Plus if the answer to your question isn't featured, use the online form to ask us for the answer. Alternatively please telephone 01733 777623 Monday to Friday (9:30am-5:00pm) to speak to one of our sales team. Snooper SC5800 DVR Ventura mounts on the inside of your vehicles windscreen using the suction cup windscreen bracket provided. Snooper SC5800 Ventura can be powered directly either from its internal battery if it's fully charged or powered from the cigarette lighter socket. We do not recommend using a third party charger with this product. A mobile phone USB charger or a laptop may not be powerful enough to reliably charge the Snooper SC5800 DVR Ventura and may provide an incorrect voltage or insufficient power. An official genuine Snooper AC charger is available for indoor use with this product you can view and buy here. Please bear in mind that the product on this page is designed to be used in a vehicle with power provided by the included vehicle charger. The battery is for short term back up only - not for regular use. For optimum performance we recommend that you use this product connected to cigarette lighter adapter via the vehicle charger. Because of potential power surges which may damage the product you should not start your vehicle with the product connected. United Kingdom • Ireland • France • Spain • Portugal • Italy • Austria • Switzerland • Belgium • Holland • Luxembourg • Germany • Denmark • Norway • Sweden • Finland • Poland • Estonia • Lithuania • Czech Republic • Latvia • Liechtenstein • Hungary • Romania • Slovakia • Slovenia • Serbia • Montenegro • Croatia • Turkey • Greece • Albania • Bosnia & Herzegovina • Bulgaria • F.Yugoslavia Rep.of Macedonia • Ukraine • Cyprus • Russia. Snooper SC5800 Ventura provides advanced warning of all fixed speed cameras, SPECS and many laser sites using Snooper's AURA speed trap database. There are 3 easy ways to pay using a credit or debit card. 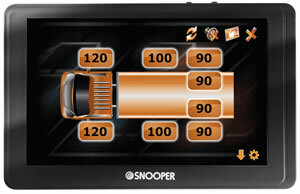 The Snooper S5800 DVR will only operate on Windows computers. Specifically, you must be using Windows 7, Windows 8, Window 8.1 or Windows 10. Additionally the software will only work with Internet Explorer 6 or Netscape Navigator 6 or above. Please note: The Snooper SC5800 DVR is not compatible with and will not operate when using earlier Windows or Apple Macintosh operating systems. The Snooper SC5800 DVR Ventura comes supplied with everything you need to use it in your car (see What's in the box? above), however replacement and additional SC5800 DVR accessories are also available to buy from ActiveGPS.